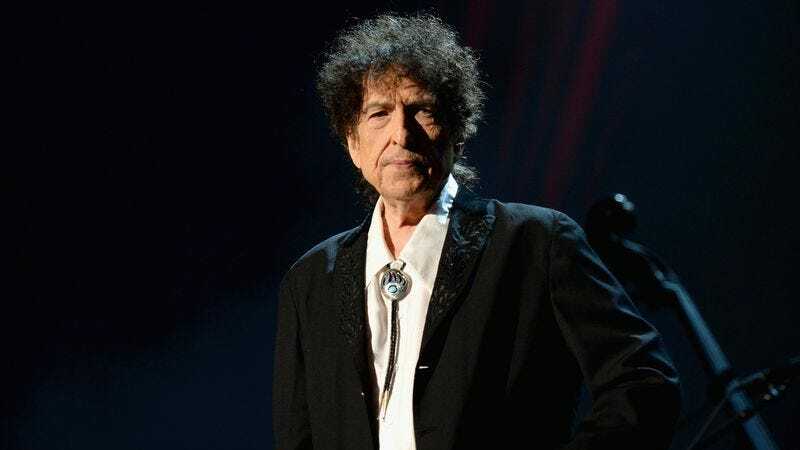 When Bob Dylan was announced as the winner of this year’s Nobel Prize for Literature, the award was the subject of criticism from commenters like Trainspotting author Irvine Welsh, who said on Twitter, “I’m a Dylan fan, but this is an ill conceived nostalgia award wrenched from the rancid prostates of senile, gibbering hippies.” Well, apparently Dylan agrees, because now The Associated Press reports that he’s decided it’s not worth the effort to fly all the way to Sweden just to pick up some dumb award. Of course, that’s not how the Swedish Academy put it, saying that Dylan “wishes he could receive the prize personally, but other commitments make it unfortunately impossible” for him to pick up his Nobel Prize in person. The committee goes on to say that the move is “unusual, but not exceptional”: In 2004, Austrian novelist Elfriede Jelinek declined to attend the Nobel Prize ceremony, citing social anxiety. Dylan has given no such excuse, but the Nobel ceremony does happen to fall on the same week as the Victoria’s Secret Fashion Show, and, as we all know, Dylan’s a fan. Dylan, who took two weeks to acknowledge that he had even won the award, isn’t off the hook yet, though. He’s still required to give a Nobel lecture within six months of the prize ceremony, which will take place in Stockholm on December 10.